One more Kyrgyzstan-focused Feel Good Friday before I leave - tomorrow! 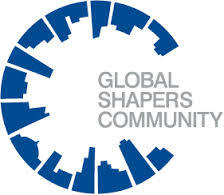 Global Shapers Community is, according to the website, "a network of city-based Hubs developed and led by young leaders between 20 and 30 years old who want to develop their leadership potential towards serving society. To that end, Hubs undertake local projects to improve their communities." An initiative of the World Economic Forum, there are currently 453 Hubs worldwide. Global Shapers - Bishkek is a group of 10 women and men working in the capital of Kyrgyzstan. They are described as "young people who are exceptional in their potential, their achievements and their drive to make a contribution to their communities." It's no exaggeration. I clicked randomly on the profile of Jenny Ensi Tszie. She came to New York to get an MSW from Columbia University then returned to Kyrgyzstan to advise the Minister of Economy on strategic investments, run a consulting company for small and medium investors and co-found a youth volunteering group to help victim families and children in the conflict zone. Oh, and she also speaks Kyrgyz, Chinese, English, Russian and is learning Arabic. Two examples of projects the shapers organize include Big Brothers Big Sisters, a program that pairs university students with high school students for mentoring and Clean City, Clean Bishkek which involved a flashmob style performance to support the Eco-Education festival. To keep up with the group, you can like their Facebook page and follow them on Twitter @ShapersBishkek. As for me, I'll be watching for the flashmob when my plane lands.